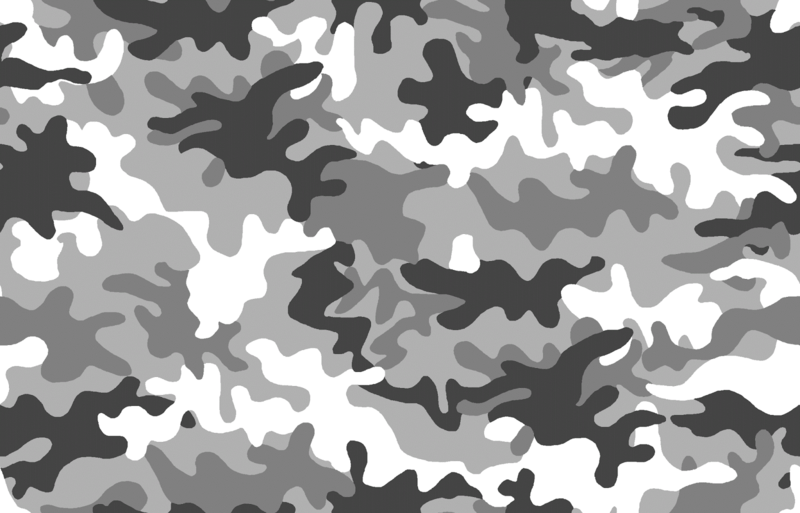 Painting camouflage can be a daunting task. When you look at real world camo it seems like it would be very difficult to pull off properly on the small scale that we miniature painters deal with. 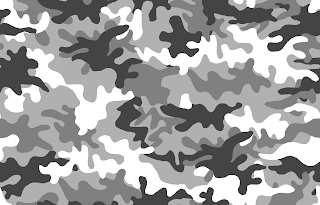 The most important thing to remember is, you are just trying to give look of camouflage but you don't need to be 100% accurate. The viewer's brain will recognize it as camouflage without each brushstroke needing to be photo realistic. 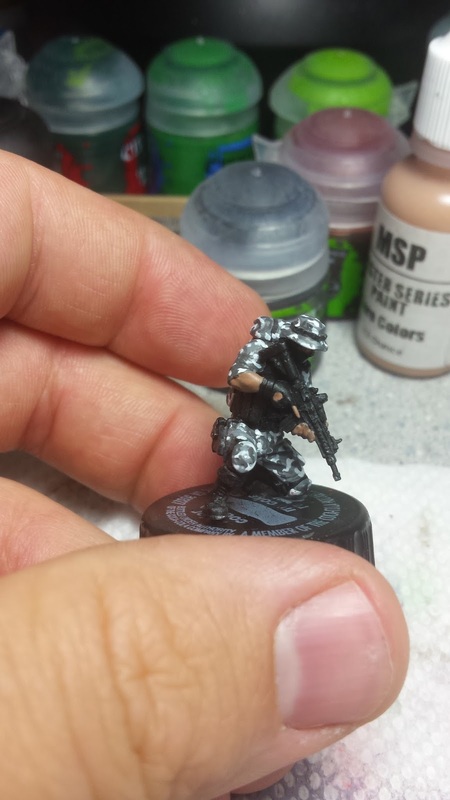 For this tutorial, we will be painting grey urban camouflage. You can use this technique to paint any color camouflage you want, even purple! You'll just need to adjust your colors accordingly. Before we get started. I need to point out that I learned my method of painting Camouflage from watching Kujo Painting and his video tutorial on the subject.  Before watching that I had no idea how to start doing camouflage and afterwards I was able to break down the colors and order of application a lot easier. My process is really similar to what he spoke of in his video. If you've seen his video you'll notice I follow many of the steps as well. Though, by the end, my camouflage ends up coming out different than his. But, credit where credit is due, thanks Kujo for his tutorial and helping me nail the style so I could finish Pinned Down, Taking Fire. Without him I'd still wondering how to start. 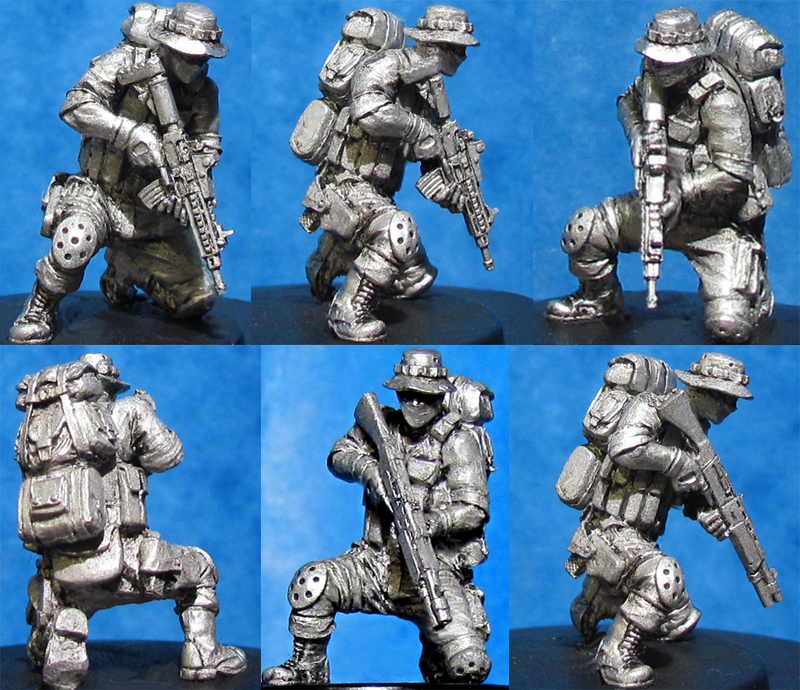 Today I'll be using Woody from Hasslefree Miniatures one of the minis from my Pinned Down piece. I thin all my paint with Liquitex Matte Medium and water. There are other additives you can use as well, you've just got to play with it and see what works for you. Not only does Liqutex Matte Medium help thin the paint, it also makes your supply last longer. I go through a lot less paint now-a-days than I did in the old days. My mix is usually 2 drops of paint, 1 drop of Liquitex and 2 drops of water, depending on paint brand. I prime my minis with Games Workshop's Skull White, but you could use a different brand. Be wary of Rustoleum and Krylon, I've had mixed results. Sometimes the chemicals in the spray react to the plastic of the mini, slowing dry times or damaging the mini. Once the mini is cleaned of all mold lines and washed thoroughly, prime it with Games Workshop Skull White spray. Though on Woody I dual primed him along with Badger and the base for Pinned Down, Taking Fire in one go. Depending on the color, you can prime with black too and have no problems. Primer color doesn't really matter here, just that it is primed. To dual prime, start with Black and then do a zenith highlight with Skull White by spraying from directly above them. 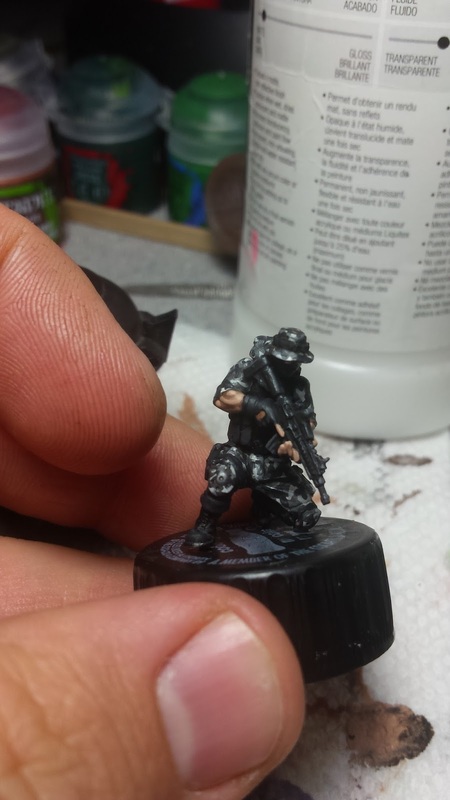 Using Black and Neutral Grey, Base Coat the entire mini, planning out your camouflage areas ahead of time. You need to break up the camo a bit, since painting the entire mini in camo will cause you to hide all the details. If you do paint all the clothing and armor in camo it will actually hinder your final effect. 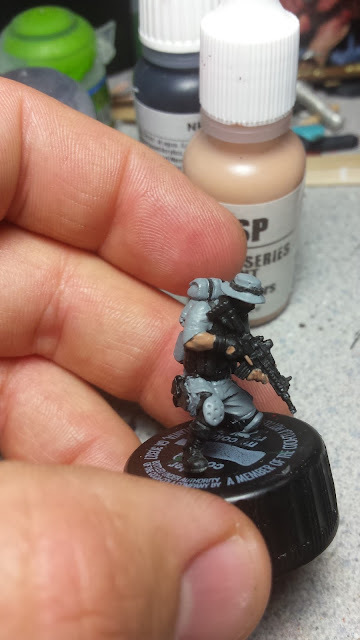 So, anywhere you want camo to be will be base coated in Neutral Grey, while the clothing and equipment will be painted with Black. You'll want a nice even coat of paint here, so make sure you take your time and use thin layers to build up the coverage. 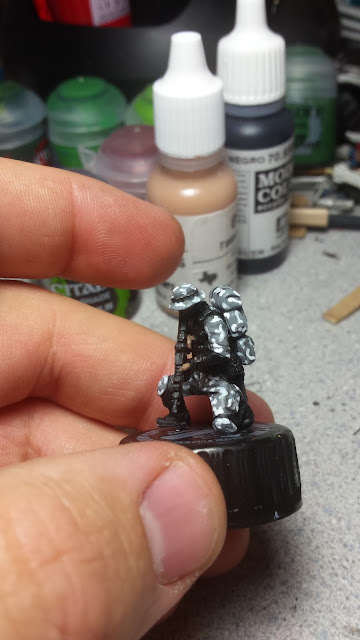 Note: if you primed Black, you only need to pick out the areas where the camo needs to be painted, as the black areas can be left alone until later. I fail, and I missed the picture of this step. So I'll try to explain it as best as possible. Next up, mix some Grey Green with water. You want it to be thin, so you can glaze the recesses of the camo areas with it. But not so thin that it runs all over the surface. Make sure you hit any area which meets up with belting or armor plating too. Basically, any seam, fold, crease, crevasse or area that is covered by a bag, pouch, flap, needs to have this painted with a Grey Green wash. 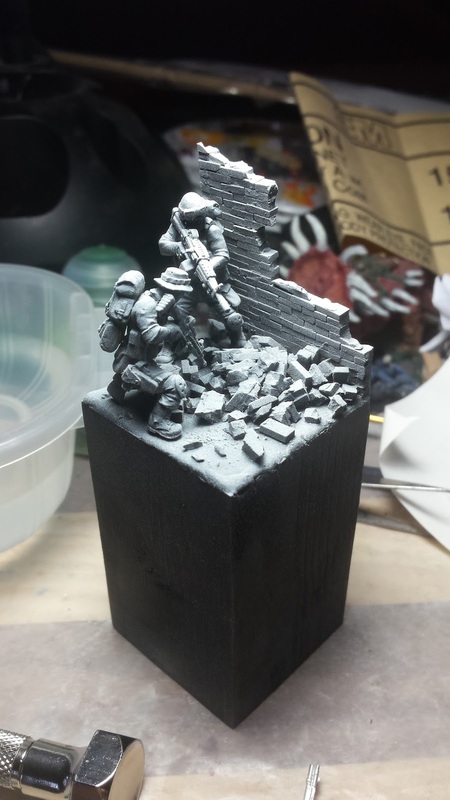 This will help give depth to the camo later, since we aren't going to do any highlighting on the camo areas. 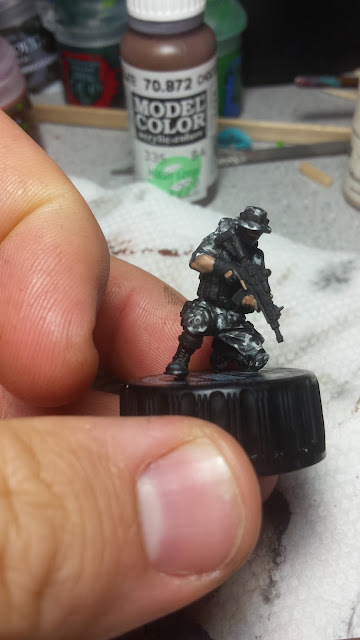 With the wash dry, load up your brush with White and start making splotches on the camo areas. You want them to be a decent size, since they will be getting covered in later steps and you don't want them to be completely hidden. Just make random lines of varying thickness and shape. You don't want straight edges here, random squiggles is the key. Next up take Grey Green and paint some random shapes connecting the white areas, make sure you also slightly overlap the white. You can also paint areas that touch white, but do not connect to other white areas. Now with German Grey, lay down thin lines along and running through the Green Grey areas. It helps if you paint these lines perpendicular to the Green Grey lines, striking through white areas as well. These lines will need to be sparse compared to the Green Grey lines (note the image at the top of the page). Finally, wash the entire camo area with Nuln Oil. Make sure you don't let it pool up on the recesses though. You want the areas in the recesses to still retain their camo pattern without being overpowered by the darkness of the wash.
And that's it! Grey Urban Camouflage. With the hard part out of the way now it's time to finish painting the mini. Here's what this guy looks like after he's all finished. I hope this helped you with your camo. As always, feel free to leave a comment below, you can also catch me on Twitter @ryglore pretty much anytime. Worked good. Thanks for the tips!